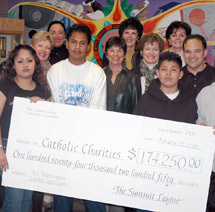 Your support makes our work at Catholic Charities of Santa Clara County possible. There are many ways you can take a stand against poverty and help poor families, the elderly, children and youth, the homeless, refugees, and the mentally ill.
You can make a tax-deductible contribution today through our secure donation website, or call (408) 325-5288. Any donation makes a difference, We especially need monthly pledges to support our many ongoing programs. Donors who make annual contributions of $1,000 or more are invited to join our CaritasSociety.